Home » Are you building an organization that innovates? The June issue of Harvard Business Review includes a provocative article by the authors of a new book, Collective Genius: the Art and Practice of Leading Innovation. In a clear-eyed discussion of what makes some organizations capable of consistent innovation and others unable to move beyond status quo, the authors Hill, Brandeau, Truelove, and Lineback, outline important differences in leadership approaches between organizations that create and those that don’t. What they end up describing in many ways matches our own definition of transformational leadership. To begin with, they identify a direct link between leadership and innovation. But not surprisingly, they move away from the leader who sets the vision and motivates others to buy it. Instead their research suggests that effective leaders of innovation begin with a focus on community-building. Without that sense of community, they posit, innovation does not consistently occur. For some school leaders, spending the time developing a sense of community within their team sounds like a waste. It’s that “soft stuff” that doesn’t move the organization forward; and many of us are facing urgent and wickedly complex problems that demand our attention. In truth, research is clear—building strong collegial connections is the essential first step in creating resilient teams that can weather the inevitable storms that so frequently toss schools to and fro. And beyond weathering the storm, a sense of community supports a team’s ability to innovate to higher ground. Note that the collegiality Hill et al. describe in the article is not the same thing as congeniality. It is not about having an active social committee and Friday get-togethers after work. 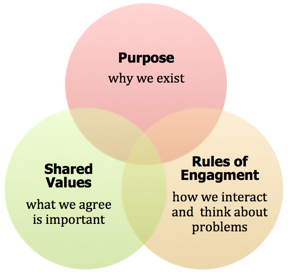 A sense of community emerges from important conversation and rests on three elements: purpose, shared values, and rules of engagement. To form a community, team members need to decide what they believe in. Values influence individual and collective action. Hill and her colleagues investigated many organizations, and the values differed from one to another. But they found four consistently innovative organizations, and all of them had four predominant values: bold ambition, responsibility to the community, collaboration, and learning. Rules of engagement exist in two categories: how people interact and how they think. The authors identify rules that most support innovation. Community emerges from interaction and dialogue about these three elements—so thinking about how a team uses its time together is critical to a leader’s success. For example, are you using your meeting time to help your team members get clear about their purpose, what they value, and the norms for their interaction and problem-solving. Your meetings offer high leverage opportunities to build a powerful sense of community. Does it live by rules of engagement supportive of a set of core values: bold ambition, responsibility to the community, collaboration and learning? Do we have the ability to make integrative decisions, rather than compromising or letting some groups dominate. Summer can be an important time for reflection. Are you tapping into the power of collective genius? Where are you in your transformative journey?